This flavorful slow cooker Italian chicken dish is easy to prepare and cook in the slow cooker. Cream cheese and condensed soup make it creamy, and Italian salad dressing mix adds the zesty flavor. If you don't have salad dressing mix, I've included a quick homemade version below the recipe. From the positive comments I received, several people mentioned using fresh sliced mushrooms instead of canned. One person added some extra garlic because she used low-fat soup and cream cheese, and another person said she was asked to bring it to every potluck dinner from now on! Place the chicken breast halves in the crockery insert of a slow cooker. Combine salad dressing mix and water in a cup and the pour it over chicken. Cover and cook on LOW for 3 hours. In a small mixing bowl, whisk together the cream cheese and soup until well blended. Stir in mushrooms. Pour the cream cheese mixture over the chicken. Cook for 1 to 3 hours longer or until chicken is cooked through. Take care not to overcook or the chicken breasts will be dry. 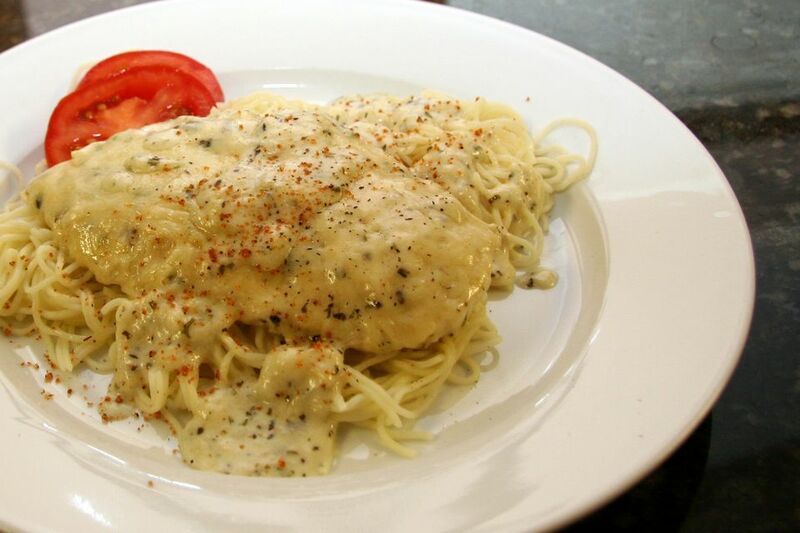 Serve this creamy Italian chicken with rice or hot cooked noodles. 1/2 teaspoon each ground black pepper, dried leaf thyme, dried leaf basil, and dried parsley flakes. Combine the herbs and spices and then combine with the water and pour over the chicken. From Marka "I served this over Uncles Ben's Wild Rice & Chicken, the sauce was just the right consistency, the chicken absolutely yummy and with the rice it really was an elegant presentation! Heartily recommended!!!!!" Use dry white wine in the recipe in place of the water. Replace the canned mushrooms with sliced fresh mushrooms. Add chopped green onions along with the mushrooms. If desired, replace the mushrooms with frozen or canned and drained artichoke hearts or omit the mushrooms altogether. Replace the cream of chicken soup with cream of mushroom soup and 1 teaspoon of chicken bouillon granules or base.